home → Loans → Loan Basics → Get a Secured Personal Loan, Fast! Get a Secured Personal Loan, Fast! If you need to borrow money quickly but your credit is a little shaky, there aren't very many places that you can turn to. It's possible to get unsecured loans for bad credit but if you don't own a home, or you simply don't want to borrow against it, you're basically left with one of two choices: either an unsecured or a secured personal loan. Although a low-interest unsecured personal loan can be difficult to get, there are resources that grant higher-interest loans, both secured and unsecured, regardless of credit history. In this article, we'll examine some entities that make secured personal loans. Title loan companies will advance you money by putting a lien on your car. They keep the title while you keep the use of the vehicle. You must, however, own it free and clear. Depending on the age, condition and type of car, the loan amount could be up to several thousand dollars; in no case, however, will the loan be for more than about half of the vehicle's value. These loans are usually payable within 30 days, with the interest rate being as high as 25%. This makes for an annual percentage rate (APR) of 300%. If the borrower fails to pay back the loan or renew it for an additional term by paying the fees, the lender can repossess the vehicle. If the loan and other fees are still not paid, the lender can sell the car to pay the debt. Pawn shops are also in the business of making short-term, small-money loans. You bring in your personal property; a pawn broker will appraise it and loan you money against it, but it will always be much less than it's worth. Pawn shops will generally loan money on anything of value: jewelry, musical instruments, electronic equipment, small appliances, even vehicles (but unlike title companies, you do not retain the use of the vehicle while the loan is outstanding). The term of the loan is usually 30 days, and fees are generally high. If the debt is not repaid and the property not claimed, the broker is free to display it in the shop and sell it to whoever wishes to buy it. Cash advance or check-cashing stores are the brick-and-mortar secured loan version of the online fast cash lender. Here, you write the lender a personal check for the amount of the loan plus the lender's fees. Loans are usually limited to about $500. You'll receive in return the loan amount in the form of cash or a check. The lender will hold your personal check until your next pay day (but usually no longer than two weeks). 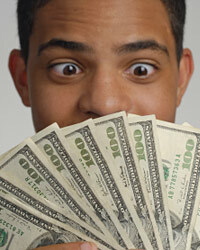 Fees charged are similar to online cash advance lenders: $20- to $40 per $100 borrowed. You can pay the loan off or renew it by paying only the fees. If you do neither, the lender will deposit your check on the date specified. If you don't have the money in your account to cover the check, you incur more fees, both from the lender and your bank. These secured personal loans are designed to short-term, emergency funding resources. You'll pay very high fees and rates when using them. They can serve a positive purpose if you simply must have cash, provided that you pay them off quickly. As always, shop around, and use sound judgment when doing business with these lenders.